3" FlexRite Single Wall Petroleum Pipework available upon reels of upto 90m . Suitable for use with either single wall swivel or swaged male adapter pipe couplings. 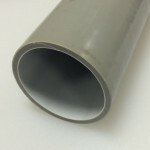 Approved to EN14125 by ERA in the UK for use as pressure, suction or vent pipework. This flexible pipwork system allows complete runs between tanks and pumps to be installed without joints thus avoiding pressure losses and potential leak paths.